Stock up with cold-weather Hand and Toe Warmers Big Packs from Grabber Warmers! Put one in your car, one in your desk, one in your coat closet, and one in your emergency kit. Never be without portable heat when you need it. Air-activated winter Hand Warmers keep hands and fingers toasty for over 7 hours. No shaking or kneading required; just open the package and put them in your glove or pocket for a few minutes to start the process. Cold weather Toe Warmers are the perfect everyday solution for cold toes. Thin with a unique rounded toe and adhesive backing, they are designed to function in the low oxygen environment of boots and shoes. Simply stick the Toe Warmer packs to the outside of your sock, under or over your toes, and enjoy more than 6 hours of warmth. Make these cold weather, winter warmers standard equipment on you next trip to the slopes! Each Toe Warmer Big Pack contains 8 pairs. 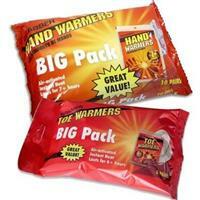 Each Hand Warmer Big Pack contains 10 pairs. All Grabber Warmers are designed for one-time, disposable use. Each Pack is sold seperatly. Last 6 plus hours. Do not spend a day on the slopes without hand warmers in the pocket. They make for a great gift-perfect stocking stuffer! You'll be kept warm for hours. Perfect for those cold Eagles games, and long days in the snow! Pros: They last 4-5 hrs on a cold day. Cons: The adhesive could be improved. Toe warmers are a low tech solution to cold feet. My family is always using these at our sporting events. A must for anyone spending time in the colder weather. They really last hours. Great bang for the buck. Always have them on hand. Cons: make sure you get the right size for feet! Great for skiing or outdoor sporting events! Great product when its really cold. I use both. Works every time. Pros: warm hands and toes! Keeps your toes warm for hours! Love these, use them all the time. Just open the package and drop them in your boot or put them in your pocket. Great for kids too! Pros: stays warm for hours! I have used these products numerous times in the past and they have never disappointed me! They stay hot for hours and are very portable.